Freshman Taylor Kissinger scored 22 points to lead four Huskers in double figures as Nebraska rolled to an 88-55 women’s basketball win over Minnesota State-Mankato in exhibition play at Pinnacle Bank Arena on Sunday. Kissinger, a 6-1 guard from Minden, Neb., dazzled with 10 first-half points in just 11 minutes of play. Kissinger finished 7-of-15 from the field, including 4-of-12 from three-point range, while adding two rebounds, two blocks and a steal in 22 minutes in the game. Sophomore guards Hannah Whitish (Barneveld, Wis.) and Bria Stallworth (Chicago, Ill.) each added 15 points, combining to go 11-of-22 from the floor, including 4-for-9 from long range. Whitish added five assists, no turnovers, five rebounds, a steal and a block. Stallworth pitched in three assists and two boards in 17 minutes. Junior forward Maddie Simon added 11 points, including seven in the fourth quarter, while contributing five boards and two steals. Senior Jasmine Cincore just missed double figures with eight points, while also leading the Huskers with eight rebounds and seven steals in a team-high 28 minutes. As a team, Nebraska hit 46.4 percent (32-69) of its shots, including 39.3 percent (11-28) from three-point range and 13-of-18 free throws (.722). 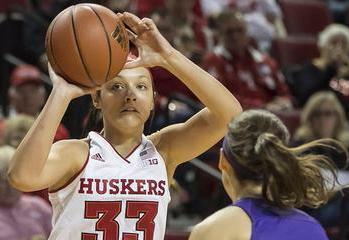 The Huskers outrebounded Minnesota State, 50-39, with all 10 players grabbing at least two rebounds. Nebraska’s defense featured seven blocks, which would have been its second-best total of 2016-17. The Huskers held Minnesota State to just 28.8 percent (19-66) shooting from the floor, but the Mavericks did hit 10-of-27 threes (.370). Nebraska led 41-27 at the half after hitting 50 percent (15-30) of its shots from the field, including 4-of-11 from three-point range and 7-of-9 at the free throw line. The Huskers held Minnesota State to just 28.6 percent (10-35) from the field, but the Mavericks knocked down 7-of-15 three-pointers to stay within striking distance. The Mavericks were just 3-for-20 from two-point range. After the break, Kissinger continued to shine on offense, adding two more threes midway through the third quarter, while Whitish followed up with two consecutive treys of her own extending the Husker lead to as much as 30 points (64-34) in the third quarter. Stallworth again came alive in the final three minutes of play, adding eight points including a three-pointer to seal the 33-point victory, the largest lead of the contest. As a team, the Huskers combined for 20 assists on the day, led by Whitish with five assists and senior Emily Wood (Salina, Kan.) with four assists. Wood also hit a pair of three-pointers in the contest. In addition to the victory, Nebraska celebrated Alumni Weekend, welcoming back nearly 50 former Husker players, coaches and staff members, including 1993 National Player of the Year Karen Jennings, two-time WNBA All-Star Anna DeForge, 1999 National Defensive Player of the Year Nicole Kubik and former Husker head coach Angela Beck (1986-97) and a strong contingent from Nebraska’s 1988 Big Eight championship team. The Huskers will open the regular season at home when they host SIU Edwardsville on Saturday, Nov. 11 at Pinnacle Bank Arena. Tip-off is set for 3 p.m. with tickets available now at Huskers.com.